Taiwanese people (Chinese: 臺灣人 / 台灣人) are people from Taiwan who share a common Taiwanese culture and speak Mandarin Chinese, Hokkien, Hakka, or Aboriginal languages as a mother tongue. Taiwanese people may also refer to individuals who either claim or are imputed cultural identity focused on Taiwan or areas under the control of the Government of the Republic of China since 1945, including Penghu, Kinmen, and Matsu islands (see Taiwan Area). At least three competing (occasionally overlapping) paradigms are used to identify someone as a Taiwanese person: nationalist criteria, self-identification (including the concept of "New Taiwanese") criteria, and socio-cultural criteria. These standards are fluid, and result from evolving social and political issues. The complexity resulting from competing and evolving standards is compounded by a larger dispute regarding Taiwan's identity, the political status of Taiwan, and its potential de jure Taiwan independence or Cross-Strait Unification. According to government figures, over 95% of Taiwan's population of 23.4 million consists of Han Chinese, while 2.3% are Austronesian Taiwanese aborigines. The category of Han Chinese consists of the three main groups: Hoklo, Hakka, and mainland Chinese. However, acculturation, intermarriage and assimilation have resulted in some degree of mixing of the Han and Taiwanese Aborigine blood lines. Although the concept of the "four great ethnic groups" was alleged to be the deliberate attempt by the Hoklo-dominated Democratic Progressive Party (DPP) to defuse ethnic tensions, this conception has become a dominant frame of reference for dealing with Taiwanese ethnic and national issues. Despite the wide use of the "four great ethnic groups" in public discourse as essentialized identities, the relationships between the peoples of Taiwan have been in a constant state of convergence and negotiation for centuries. The continuing process of cross-ethnic mixing with ethnicities from within and outside Taiwan, combined with the disappearance of ethnic barriers due to a shared socio-political experience, has led to the emergence of "Taiwanese" as a larger ethnic group, except on the island of Kinmen whose populace consider themselves as Kinmenese or Chinese, and as well as inhabitant of Matsu Islands whereby they also consider themselves as Matsunese or Chinese. All citizens of the Republic of China. Those who hold the citizenship (nationality) of the Republic of China, not necessarily those based in Taiwan or Penghu, but also include those living in Kinmen, Matsu Islands and other ruling territory of the Republic of China. This meaning is not accepted by the people of Kinmen and Matsu Islands. Ancestors who before the Japanese rule of Taiwan had moved to the island of Taiwan, Penghu islands, and minor islands around Taiwan. This includes the ancient Yue people, Han-Chinese, Taiwanese aborigines as well as Dutch people. In addition, this later includes Japanese migrants from Japan to Taiwan during the Japanese rule of Taiwan and their descendents today. People living outside Taiwan before or after 1949, but are of Taiwanese ancestry or descent, who may live in other territories including Mainland China and do not necessarily hold the nationality of the Republic of China. They may not necessarily be born or live in Taiwan. Outside Taiwan, they are known as 海外华人 or 华人 or 华裔. Some people may wish to emphasize 台湾人, so they may use 台裔 or 台人. Besides the factors as above for consideration, whether one identify oneself as a Taiwanese, depends also on how a person and another person (predominantly those of kinship)'s self-identification. The earliest notion of a Taiwanese group identity emerged in the form of a national identity following the Qing Dynasty's ceding of Taiwan to Japan in the Treaty of Shimonoseki in 1895 (Morris 2002:3–6). Prior to Japanese rule, residents of Taiwan developed relationships based on class solidarity and social connections rather than ethnic identity. Although Han often cheated Aborigines, they also married and supported one another against other residents of the same ethnic background. Taiwan was the site of frequent feuding based on ethnicity, lineage and place of origin (Lamley 1981; Harrell 1990[citation not found]; Shepherd 1993:310–323). In the face of the Japanese colonial hierarchy, the people of Taiwan were faced with the unequal binary relationship between colonizer/colonized. This duality between "one" and "other" was evident in the seven years of violence between the Japanese and groups of united anti-Japanese Han and Aborigines (Katz 2005). Only later did the Japanese attempt to incorporate Taiwanese into the Japanese identity as "loyal subjects", but the difference between the experience of the colonized and the colonizer polarized the two groups (Fujii 2006:70–73). The concept of "race" was utilized as a tool to confirm and facilitate Japanese political policies. A system of household registers (koseki) based on the notion of race to separate and define groups of subjects. From within the group of "non-Japanese" the government divided Han citizens into "Han" and "Hakka" based on their perception of linguistic and cultural differences. The Japanese also maintained the Qing era classification of aborigines as either "raw" or "cooked" (Brown 2004:8), which to the Japanese embodied the social ramification of ethnic origin and perceived loyalty to the empire (Wolf & Huang 1980:19). I referred to the "many sangokujin who entered Japan illegally." I thought some people would not know that word so I paraphrased it and used gaikokujin, or foreigners. But it was a newspaper holiday so the news agencies consciously picked up the sangokujin part, causing the problem. ... After World War II, when Japan lost, the Chinese of Taiwanese origin and people from the Korean Peninsula persecuted, robbed and sometimes beat up Japanese. It's at that time the word was used, so it was not derogatory. Rather we were afraid of them. ... There's no need for an apology. I was surprised that there was a big reaction to my speech. In order not to cause any misunderstanding, I decided I will no longer use that word. It is regrettable that the word was interpreted in the way it was. 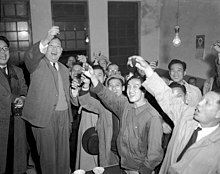 Non-Kuomintang politician Wu San-lien (2L) celebrated his landslide victory (65.5%) in the first-time Taipei city mayoral election in January 1951 with his supporters. Taipei has been the capital of Taiwan since December 1949. In 1945, the Taiwanese faced a new unequal binary relationship when Taiwan entered the political sphere of the Republic of China (ROC). Shortly following the Kuomintang (KMT) arrival, however, social conflict erupted in the midst of rampant government corruption, soaring inflation and an increasing flow of immigrants from China (see February 28 Incident). The latter were preferred for jobs in the civil service as opposed to Taiwanese who were regarded as "untrustworthy"(Phillips 2003:8–9). Recurrent violent suppression of dissent also played an important role in enforcing a separate sense of "Taiwanese-ness" (Gates 1981:253–275). Under the KMT structure, "Taiwanese" became a strong "regional" identity. The term has often been used synonymously with benshengren, a term which covered both Hokkien and Hakka whose ancestors arrived in Taiwan before the Japanese restrictions on immigration in 1895. "Taiwanese" was used in contrast with waishengren (mainlanders), who included the people who followed the KMT to Taiwan between 1945 and 1949 and their descendants. The government tended to stress provincial identities, with identification cards and passports issued until the late 1990s displaying one's ancestral province and county. During this period the terms "cooked" and "raw" Aborigines disappeared. The former "raw" Aborigines were termed Shandi Tongbao, Gaoshanzu (Mountain Race) or Gaoshan Tongbao (Mountain Compatriots). Lee Teng-hui became the first president of the Republic of China to be born in Taiwan. He was democratically elected in 1996. With Taiwan's political liberalization in the 1970s and 1980s, encouraged by Taiwan's changing international status, the concept of a "Taiwanese people" became politicized by opponents of the KMT. The tangwai movement deployed concepts of "Taiwanese identity" against the authoritarian KMT government, often using extreme tactics to build a short-term ethno-centric opposition to the KMT (Edmunson 2002:34–42)[citation not found]. The campaign saw resonance with the people of Taiwan and the term "Taiwanese" has been used by politicians of all parties to refer to the electorate in an effort to secure votes. The concept of a separate Taiwanese identity has become such an integral factor to the election culture in Taiwan, that identifying as a Taiwanese has become essential to being elected in Taiwan (Corcuff 2002:243–249). The term "New Taiwanese" (新臺灣人) was coined by former President of the Republic of China, Lee Teng-hui in 1995 to bridge the ethnic cleavage that followed the February 28 Incident of 1947 and characterized the frigid relations between waishengren and benshengren during forty years of martial law. Although originally aimed at the successive generations of Taiwanese with mainlander ancestry, it has been further articulated by Lee and other political and social leaders to refer to any person who loves Taiwan and is committed to calling Taiwan home. Although critics have called the "New Taiwanese Concept" a political ploy to win votes from benshengren who regarded the KMT as an alien regime, it has remained an important factor in the dialectic between ethnic identities in Taiwan. Despite being adopted early on by former Provincial Governor James Soong (1997) and later by, then Taipei mayoral candidate Ma Ying-jeou (1999), the term has since been dropped from contemporary political rhetoric (Corcuff 2002:186–188). In contemporary Taiwan the phenomenon of mixed marriages between couples comprising different ethnic groups has grown to include people from the Indian subcontinent, southeast Asia, Europe, the Americas and the Pacific Islands. The increasing number of marriages between Taiwanese and other countries creates a problem for the rigid definitions of ethnic identity used by both the ROC and the PRC when discussing Taiwan (Harrell 1995). In one-fourth of all marriages in Taiwan today, one partner will be from another country and one out of every twelve children is born to a family of mixed parentage. As Taiwan's birthrate is among the lowest in the world, this contingent is playing an increasingly important role in changing Taiwan's demographic makeup. By 2010, this social-cultural group of people is typically known as "Taiwan's new resident (台灣新住民 lit. "New Residents in Taiwan" pinyin: Xīnzhùmín; Wade–Giles: Taiwan Hsin Chu-min; [ɕin ʈ͡ʂu min]). A passport issued by the Republic of China, with the word “Taiwan” in Latin script on the cover, but without the corresponding Han characters. In a 2002 poll by the Democratic Progressive Party, over 50% of the respondents considered themselves "Taiwanese" only, up from less than 20% in 1991 (Dreyer 2003). In 2006, Wu Nai-teh of Academia Sinica said that "many Taiwanese are still confused about identity, and are easily affected by political, social, and economic circumstances." In a poll released in December 2006 by the Straits Exchange Foundation (SEF), 57% of people on Taiwan consider themselves to be Taiwanese, 23% Chinese and 20% both Chinese and Taiwanese (China Post, 2006). In June 2008, according to a poll from a Taiwanese television network TVBS, when the respondents are not told that a Taiwanese can also be a Chinese, 68% of the respondents identify themselves as "Taiwanese" while 18% would call themselves "Chinese". According to an annual household interview polls conducted by the National Chengchi University, in 1991, only 13.6 percent of people identified themselves as Taiwanese, while by 2014, the number had risen to 60.2 percent and those who identified themselves as Chinese declined to only 3.4 percent. The poll also found "in 2014, around 32.6 percent of interviewees think of themselves as both Taiwanese and Chinese." The sense of a collective Taiwanese identity has continued to increase despite fluctuations in support for pro-independence political parties. This has been cited as evidence that the concept of Taiwanese identity is not the product of local political manipulation, but an actual phenomenon of ethnic and sociopolitical identities (Corcuff 2002:137–149, 207; Hsiau 2005:157–170). According to governmental statistics, over 95% of Taiwan's 23.4 million people are Han Chinese, of which the majority includes descendants of early Hoklo immigrants who arrived from Fujian in large numbers starting in the 17th century. 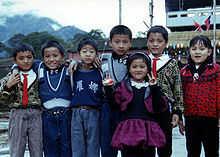 A significant minority of the Han group are the Hakka people, who comprise about 15% of the total population. The Hakkas emigrated chiefly from eastern Guangdong, speak Hakka Chinese, and originally took up residence in hilly areas. The so-called "mainland Chinese" Han subgroup includes and descends from the 2 million Nationalists who fled to Taiwan following the communist victory in mainland China in 1949. The non-Han Austronesian population of Taiwanese aborigines comprises about 2.3% of the population and have inhabited the island for millennia. Migration to Taiwan from southern Asia began approximately 12,000 BC, but large-scale migration to Taiwan did not occur until the 18th to the beginning of the 20th century as a result of political and economic chaos in mainland China. The first large scale migration occurred as a result of the Manchu invasion and conquest of China, overthrowing the Ming dynasty and establishing the Qing dynasty, which was established in 1644 and remained until 1911. In 1624, the Dutch East India Company established an outpost in modern-day Anping, Tainan in southern Taiwan after expelling the Spanish. The Dutch soon realized Taiwan's potential as a colony for trading deer hide, venison, rice, and sugar. However, Aborigines were not interested in developing the land and transporting settlers from Europe would be too costly. Due to the resulting labor shortage, the Dutch hired Han farmers from across the Taiwan Strait who fled the Manchu invasion of Ming dynasty China. Koxinga brought along many more Chinese settlers during the Siege of Fort Zeelandia in which he expelled the Dutch. Migration of male laborers from Fujian, steadily increased into the 18th and 19th century. In time, this migration and the gradual removal of ethnic markers (coupled with the acculturation, intermarriage and assimilation of plains Aborigines with the Han) resulted in the widespread adoption of Han patterns of behavior making Taiwanese Han the ethnic majority. It was not until the Japanese arrival in 1895 that Taiwanese first developed a collective Taiwanese identity in contrast to that of the colonizing Japanese. When the Chinese Civil War broke out between Kuomintang nationalists and the Chinese communists in 1945, there was another mass migration of people from mainland China to Taiwan fleeing the communists. These migrants are known as the mainland Chinese. Taiwanese aborigines are the indigenous peoples of Taiwan. They speak languages that belongs to the Austronesian language family, and are culturally, genetically and linguistically closely related to the ethnic groups of Maritime Southeast Asia and Oceania. Their ancestors are believed to have been living on the islands for approximately 8,000 years before major Han Chinese immigration began in the 17th century (Blust 1999). Taiwan's Austronesian speakers were traditionally distributed over much of the island's rugged central mountain range and concentrated in villages along the alluvial plains. Today, the bulk of the contemporary Taiwanese aborigine population reside in the mountains and the major cities. The total population of recognized aborigines on Taiwan is approximately 533,600, or approximately 2.28% of Taiwan's population. The cities of Yilan, Hualien, and Taitung are known for their aboriginal communities. In the 1990s several groups of recognized indigenous peoples, which had traditionally viewed themselves as separate, united under the singular ethnonym '原住民' or 'Aborigines' (Stainton 1999). The Hoklo people of Taiwan and Penghu speak Hokkien and mostly originated from Fujian (specifically Quanzhou, Zhangzhou, Xiamen and Kinmen). The Hoklos account for about 70% of the total population today. During Qing rule, some Hoklo men took aboriginal brides. Some of the plains aboriginals also adopted Chinese customs and language so as to be indistinguishable from the Han. Thus, many who categorize themselves as Hoklo have some degree of indigenous ancestry. It is possible to find families where the older members still identify themselves as lowland aborigine, while the rest of the family may identify as Hoklo. Among the Hoklo, the common idiom, "has Tangshan father, no Tangshan mother" (Chinese: 有唐山公、無唐山媽; Pe̍h-ōe-jī: Ū Tn̂g-soaⁿ kong, bô Tn̂g-soaⁿ má) refers how the Han people crossing the Taiwan Strait were mostly male, whereas their offspring would be through marriage with female Taiwanese aborigines. The term "Chinese Formosans" has been used to imply Hoklo descendants, though this term has also been used to denote the Taiwanese people (whether of pure or mixed origin) in contrast to the Japanese and mountain aborigines. The deep-rooted hostility between Taiwanese aborigines and (Taiwanese) Hoklo, and the Aboriginal communities' effective KMT networks contribute to Aboriginal skepticism against the DPP and the Aboriginals tendency to vote for the KMT. Taiwan's Hakka people descend largely from Hakka who migrated from southern and northern Guangdong to Taiwan around the end of the Ming dynasty and the beginning of the Qing dynasty (ca. 1644). The Taiwanese Hakka communities, although arriving to Taiwan from mountains of eastern Guangdong and western Fujian, have also likely mixed through intermarriage with lowland Aborigines as well. Hakka family trees are known for identifying the male ancestors by their ethnic Hakka heritage while leaving out information on the identity of the female ancestors. Also, during the process of intermarriage and assimilation, many of the lowland Aborigines and their families adopted Hoklo and Hakka family names. Much of this happened in Taiwan prior to the Japanese colonization of Taiwan, so that by the time of the Japanese colonization, most of the population that the Japanese classified as "Chinese" Hoklo and "Chinese" Hakka were in truth already of mixed ancestry. Physical features of both Taiwanese aborigine and Chinese can be found amongst the Taiwanese mainstream today. It is commonly disputed that Taiwanese are not Chinese despite common or similar societal beliefs. DNA studies have shown mixed results of both Chinese ancestors and Taiwanese Aborigines. This finding would support both views, which does not clear the air any more than it had been already. "Mainlanders" or "Waisheng Ren" are used by some to refer to the post-war immigrants (and sometimes also their descendants) who followed the KMT to Taiwan between 1945 and 1950. The descendants of mainlanders settled first within the heart of large urban centers in Taiwan such as Taipei, Taichung, or Kaohsiung. High numbers of government officials and civil servants who followed the KMT to Taiwan and occupied the positions of the colonial government moved into the official dormitories and residences built by the Japanese for civil servants. The ghettoization of mainlander communities exacerbated the divisions imagined by non-mainlander groups, and stymied cultural integration and assimilation into mainstream Taiwanese culture (Gates 1981). Nationalization campaigns undertaken by the KMT established an official "culture", which reflected the KMT government's own preference for what it considered authentic Chinese culture. This excluded many of the local Taiwanese practices and local cultures, including the diverse cultures brought to Taiwan by the mainlanders from all parts of China (Wachman 1994). Unlike, the Hoklo and Hakka of Taiwan, who felt excluded by the new government, the mainlanders and their families supported the nationalists and embraced the official "culture" as their own, with "national culture" being taught in school (Wilson 1970). The mainlanders used their embrace of Nationalist culture to identify themselves as the authentic Chinese people of Taiwan. In addition to the Han people, there were also small numbers of Mongols, Hui, Manchu and other ethnic minorities among the Waishengren. Burmese Chinese have settled mostly in Zhonghe District, located in Taipei County. The job boom in the factories there has attracted an estimated 40,000 Burmese Chinese immigrants (c. 2008) which are 10% of the city's population. This is "believed to be the largest Burmese Chinese community outside of Burma." Taiwan Hsin Chu-min (台灣新住民 lit. "New Residents in Taiwan" pinyin: Xīnzhùmín; [ɕin ʈʂu min]) is a group that consists of mainly new residents, originally from other nations, who have either migrated to Taiwan or inter-married with a local Taiwanese. The majority of new residents originated from Vietnam, Indonesia, Thailand, and Philippines. As of 2018, there are more than 710,000 foreign labors employed in Taiwan in both blue and white collar industries. Chinese Taipei School in Malaysia. In November 2014 the Taipei Times cited an estimate of 1 million Taiwanese living within mainland China. In the United States, there are 230,382 to 919,000 people of Taiwanese descent living there. They are mostly concentrated in California, New York, and Texas. There are over 91,000 Taiwanese people in Canada, mainly living in the provinces of British Columbia and Ontario. The Hoklo and Hakka linguistic groups, which statistically make up the majority of Taiwan's population, can trace their historical and cultural roots to Hokkien- and Hakka-speaking peoples from what is now China, predominantly the southern provinces of Fujian and Guangdong. The original migrations from China were as male labourers under contract to the Dutch, so there was considerable intermarriage with women from plains aboriginal groups. The human leukocyte antigen typing study and mitochondrial DNA analysis performed in recent years show that more than 88% of the Taiwanese population have some degree of aboriginal origin (Sim 2003). A 2009 doctoral dissertation questions such findings and claims that "the great number of Han immigrants after the 18th century is the main reason to consider that the early genetic contribution from Plains Indigenes to Taiwanese Han has been largely diluted and no longer exists in any meaningful way." The lack of a totally complete and definite set of genetic record of plains Aborigines, or conclusive understanding of their proto-Austronesian roots, further complicates the use of genetic data (Blust 1988). It is important to mention that most immigrated Chinese are from southern China and that these people already had ancient Austronesian admixture (see Baiyue people). ^ "PLACE OF BIRTH FOR THE FOREIGN-BORN POPULATION, 2016 American Community Survey 1-Year Estimates". US Census. Retrieved 2017-10-16. ^ a b c d e f g h i j k 2016僑務統計年報 [Statistical Yearbook of the Overseas Community Affairs Council] (PDF). Overseas Community Affairs Council. 2017-09-01. Retrieved 2017-10-16. ^ 第六次人口普查-附录2-1: 按地区分的境外人员(PRC Census 2010). PRC Nat'l Bureau of Statistics. Retrieved 2017-10-16. ^ 從前登陸像成吉思汗，現在台青登陸是白骨精 (note: the article does not provide verifiable source). Global Views Monthly. 2013-03-01. Retrieved 2017-10-16. ^ "Places of Birth, 2011 National Household Survey". Statistics Canada. Retrieved 2017-10-16. ^ 2016年12月末在留外国人統計. Ministry of Justice, Japan. 2016-12-01. Retrieved 2017-10-16. ^ a b c d e f 2011僑務統計年報 [Statistical Yearbook of the Overseas Community Affairs Council] (PDF). Overseas Community Affairs Council. 2011-09-01. Retrieved 2017-10-16. ^ "Ausländische Bevölkerung Fachserie 1 Reihe 2 - 2016" (PDF). Statistisches Bundesamt (Destatis). 2016-12-31. Retrieved 2017-10-16. ^ "Household Population by Country of Citizenship: Philippines, 2010" (PDF). Philippines Statistics Authority. Retrieved 2017-10-16. ^ Copper (2003), pp. 12-13. ^ Hsiau (2005), p. 105. ^ Makeham (2005), pp. 4-5. ^ Harrell & Huang (1994), pp. 14–15. ^ a b di Genova, Trista (11 July 2007). "Study explores the 'Kinmen Identity'". China Post. Retrieved 20 January 2012. ^ a b Wei, Jian-Feng (2006). "An Examination of Cultural Identity of Residents of Quemoy (Kinmen)" (PDF). Intercultural Communication Studies. 15 (1): 136–137. Archived from the original (PDF) on 29 April 2013. Retrieved 20 January 2012. ^ Huang, Sandy (6 April 2003). "Cases of mistaken identity perplexing Lienchiang County". Taipei Times. Retrieved 14 January 2009. ^ "'There's No Need For an Apology': Tokyo's boisterous governor is back in the headlines Archived 2013-04-08 at the Wayback Machine," TIME Asia, 24 April 2000. ^ Peng (1972), p. 45: "One day I fell into conversation with two Americans in a jeep beside the road (in early occupied Japan), and in passing explained to them that I was not Japanese, but a Chinese from Formosa. It was something of a shock to find myself for the first time openly and proudly making this distinction"
^ "Gender Imbalances and the Twisted Marriage Market in Taiwan" (PDF). Cicred.org. ^ Chang, Rich (12 March 2006). "'Taiwan identity' growing: study". Taipei Times. ^ 民意調查：兩會復談前國族認同民調 (PDF). TVBS. Retrieved 2008-06-20. ^ Exec. Yuan (2014), p. 47-8. ^ a b Exec. Yuan (2014), p. 48. ^ a b Exec. Yuan (2014), p. 49. ^ Davidson (1903), p. 581. ^ "Pazeh writers get awards for preserving language - Taipei Times". Taipeitimes.com. ^ "Pazeh poets honored at ceremony - Taipei Times we". Taipeitimes.com. ^ "Pingpu activists demand government recognition - Taipei Times". Taipeitimes.com. ^ Chambers's Encyclopaedia. 3. Pergamon Press. 1967. p. 438. Retrieved 20 December 2011. The majority of the population is of Chinese origin. There are about 3000000 Chinese Formosans descended from immigrants from Fukien and a further 90000 Hakka whose ancestors fled from the mainland during the century Note: Per Demographics of Taiwan, the population quoted was valid circa 1905 to 1915. By 1967, the population had already surpassed 13 million. ^ Gordon, Leonard (May 1968). "American Planning for Taiwan, 1942-1945". Pacific Historical Review. 37 (2): 215. JSTOR 3637072. ^ a b Damm, Jens (2012). "Multiculturalism in Taiwan and the Influence of Europe". In Damm, Jens; Lim, Paul. European perspectives on Taiwan. Wiesbaden: Springer VS. p. 95. ISBN 9783531943039. ^ The Hakka People, Overseas Community Affairs Council (OCAC). Taiwan. ^ News staff (23 April 2017). "Say hello to the new Taiwanese". Taiwan: The China Post. Retrieved 1 May 2017. Other top sources of Taiwan's newest citizens were Indonesia, Thailand, Philippines and Malaysia, in that order. ^ News staff (22 May 2012). "Foreign, mainland spouses of locals to be called 'new residents". Taiwan. The China Post. Retrieved 1 May 2017. ^ Chou, Christine (21 April 2017). "'Come and work here'". Taiwan. The China Post. Retrieved 1 May 2017. ^ "Foreign Workers in Productive Industries and Social Welfare by Nationality". Workforce Development Agency, Ministry of Labor Republic of China (Taiwan). Retrieved 2018-09-17. ^ "Foreign Workers for Special Professions or Technical Assignments by Permit Authority Agency and Nationality". Workforce Development Agency, Ministry of Labor Republic of China (Taiwan). Retrieved 2018-09-17. ^ Shih, Hsiao-kuang (16 November 2014). "2014 ELECTIONS: Chinese officials aiding KMT voters: sources". Taipei Times. ^ "ASIAN ALONE OR IN COMBINATION WITH ONE OR MORE OTHER RACES, AND WITH ONE OR MORE ASIAN CATEGORIES FOR SELECTED GROUPS". United States Census Bureau. United States Department of Commerce. 2011. Retrieved 18 February 2011. ^ "CIC Facts and Figures 2003" (PDF). ^ "CIC Facts and Figures 2009" (ASP). ^ Chen, Shu-Juo (2009). How Han are Taiwanese Han? Genetic inference of Plains Indigenous ancestry among Taiwanese Han and its implications for Taiwan identity (Ph.D. thesis). Stanford University. Retrieved 11 October 2013. ^ "DNA Analysis Reveals Taiwanese Have Ancestors on Mainland". En.people.cn. Retrieved 2017-04-10. ^ Li, Dongna; Li, Hui; Ou, Caiying; Lu, Yan; Sun, Yuantian; Yang, Bo; Qin, Zhendong; Zhou, Zhenjian; Li, Shilin (2008-05-14). "Paternal Genetic Structure of Hainan Aborigines Isolated at the Entrance to East Asia". PLoS ONE. 3 (5). doi:10.1371/journal.pone.0002168. ISSN 1932-6203. PMC 2374892. PMID 18478090. Anderson, Benedict (1983), Imagined Communities, NY: Verso Press, ISBN 9780860917595 . Andrade, Tonio (2006). "The Rise and Fall of Dutch Taiwan, 1624-1662: Cooperative Colonization and the Statist Model of European Expansion". Journal of World History. 17 (4): 429–450. doi:10.1353/jwh.2006.0052. Bellwood, Peter (2000), "Formosan Pre-History and Austronesian Dispersal", in Blundell, David, Austronesian Taiwan: Linguistics, History, Ethnology and Prehistory, Berkeley, CA: University of California Press, ISBN 9780936127095 . Blust, Robert (1988), Austronesian Root Theory, Amsterdam: John Benjamin's Press, ISBN 9789027230201 . Blust, Robert (1999), "Subgrouping, circularity and extinction: some issues in Austronesian comparative linguistics", in E. Zeitoun; P.J.K Li, Selected papers from the Eighth International Conference on Austronesian Linguistics, Taipei: Academia Sinica, pp. 31–94, ISBN 9789576716324 . Brown, Melissa J (2004), Is Taiwan Chinese? : The Impact of Culture, Power and Migration of Changing Identities, Berkeley, CA: University of California Press, ISBN 978-0520231825 . Bhabha, Homi K (1994), The Location of Culture, London, UK: Routledge, ISBN 9780415016353 . Council of Indigenous Peoples, Executive Yuan, Statistics of Indigenous Population in Taiwan and Fukien Areas, archived from the original on 2006-08-30 . Constable, Nicole (1996), "Introduction", in Constable, Nicole, Guest People:Hakka Identity in China and Abroad, Seattle, WA: University of Washington Press, ISBN 9780295974699 . Copper, John (2003), Taiwan: Nation State or Province? (Fourth Edition), Boulder, CO: Westview press, ISBN 9780813339559 . Corcuff, Stephane (2000), "Taiwan's "Mainlanders": A New Ethnic Category", China Perspectives no.28 April–June . Corcuff, Stephane (2002), "Taiwan's "Mainlanders", New Taiwanese? ", in Stephane Corcuff, Memories of the Future:National Identity Issues and A New Taiwan, London: M.E. Sharpe, ISBN 9780765607911 . Crossley, Pamela Kyle (1999), A Translucent Mirror: History and Identity in Qing Imperial Ideology, Berkeley, CA: University of California Press, ISBN 9780520928848 . Davidson, James W. (1903), The Island of Formosa, Past and Present, London and New York: Macmillan, OCLC 1887893, OL 6931635M . Dikotter, Frank (1992), The Discourse of Race in Modern China, Berkeley, CA: Stanford University Press . Dreyer, June Teufel (2003), "Taiwan's Evolving Identity", Paper presented at the Woodrow Wilson International Institute for Scholars, Washington, D.C., July 17 . Executive Yuan, R.O.C. (2014). The Republic of China Yearbook 2014 (PDF). ISBN 9789860423020. Retrieved 2016-06-11. Fujii, Shozo (2006), "The Formation of Taiwanese Identity and the Policy of Outside Regimes", in Liao Ping-Hui; David Wang Der-Wei, Taiwan Under Japanese Colonial Rule, 1895-1945:History, Culture, Memory, New York: Columbia University Press . Gates, Hill (1981), "Ethnicity and Social Class", in Ahern, Emily Martin; Gates, Hill, The Anthropology of Taiwanese Society, CA: Stanford University Press . Harrell, Stevan, ed. (1995), Cultural Encounters on China's Ethnic Frontiers, Seattle: University of Washington Press . Harrell, Steven; Huang, Chun-chieh (1994), "Introduction", Cultural Change in Postwar Taiwan, Boulder, CO: Westview Press . Hsiau, A-Chin (2005), Contemporary Taiwanese Cultural Nationalism, London: Routledge Press, ISBN 9780203402641 . Hsieh, Jolan (2006), Collective Rights of Indigenous Peoples: Identity Based Movement of Plains Indinenous in Taiwan, New York: Routledge Press . Lamley, Harry (1981), "Sub Ethnic Rivalry in the Ch'ing Period", in Ahern, Emily Martin; Gates, Hill, The Anthropology of Taiwanese Society, CA: Stanford University Press . Katz, Paul (2005), When the Valleys Turned Blood Red: The Ta-Pa-Ni Incident in Colonial Taiwan, Honolulu, HA: University of Hawaii Press . Lin, M.; Chu, C.-C.; Chang, S.-L.; Lee, H.-L.; Loo, J.-H.; Akaza, T.; Juji, T.; Ohashi, J.; Tokunaga, K. (2001), "The origin of Minnan and Hakka, the so-called "Taiwanese", inferred by HLA study", Tissue Antigens, 57 (3): 192–199, doi:10.1034/j.1399-0039.2001.057003192.x, PMID 11285126 . Marsh, Robert (2002), "National Identity and Ethnicity in Taiwan", in Stephane Corcuff, Memories of the Future: National Identity Issues and A New Taiwan, London: M.E. Sharpe . Martin, Howard (1996), "The Hakka Ethnic Movement in Taiwan", in Constable, Nicole, Guest People:Hakka Identity in China and Abroad, Seattle, WA: University of Washington Press . Morris, Andrew (2002), Corcuff, Stephane, ed., Memories of the Future: National Identity Issues and The Search for a New Taiwan, New York: M.E. Sharpe . Norman, Jerry (1988), Chinese:Cambridge Language Surveys, UK: Cambridge University Press . Peng, Ming-min (1972), A Taste of Freedom: Memoirs of a Formosan Independence Leader, Chicago, New York, London: Holt, Rinehart and Winston, ISBN 9780030913884 . Pietrusewsky, Michael (2000), "Metric Analysis of Skeletal Remains: Methods and Applications", in Katzenberg, Anne; Saunders, Shelly, Biological Anthropology of the Human Skeleton, New York: Wiley-Liss, Inc. .
Phillips, Steven E. (2003), Between Assimilation and Independence: The Taiwanese Encounter Nationalist China, 1945-1950, Stanford, CA: Stanford University Press, ISBN 0-8047-4457-2 . Said, Edward (1979), Orientalism, UK: Vintage Books . Sim, Kiantek (2003), 臺灣血統 [Taiwan Blood Types], Taipei: 前衛, ISBN 9789578014022 . Shepherd, John R (1993), Statecraft and Political Economy on the Taiwan Frontier 1600-1800, Ca: Stanford University Press . Stone, Anne C (2002), "Ancient DNA from Skeletal Remains", in Katzenberg, Anne; Saunders, Shelly, Biological Anthropology of the Human Skeleton, New York: Wiley-Liss, Inc. .
Stainton, Michael (1999), "The Politics of Taiwan Aboriginal Origins", in Murray A. Rubinstein, Taiwan A New History, New York: M.E. Sharpe, Inc, ISBN 9781563248160 . Teng, Emma Jinhua (2004), Taiwan's Imagined Geography:Chinese Travel Writing and Pictures 1683-1895, MA: The Harvard University Asia Center, ISBN 978-0-674-01451-0 . Wachman, Alan M. (1994), Taiwan: National Identity and Democratization, New York: M.E. Sharpe . Wilson, Richard W (1970), The Political Socialization of Children in Taiwan, Cambridge, MA: M.I.T. Press . Wolf, Arthur; Huang, Chieh-shan (1980), Marriage and Adoption in China, Stanford, CA: Stanford University Press . Wu, David Y.H (2002), "The Construction of Chinese and Non-Chinese Identities", in Susan D. Blum; Lionel M. Jenson, China Off Center: Mapping the Margins of the Middle Kingdom, HA: University of Hawaii Press . Wikimedia Commons has media related to People of Taiwan.